Some of you young ones out there (i.e. everyone under 35) may be wondering why your elders took one look at the title of this review, rolled their eyes and said “Seriously? !” Some of you may just be wondering who the Wonder Twins are and why they don’t seem to have anything to do with Wonder Woman. Don’t worry. Uncle Matt is ready to explain the lore of the long past and just what it has to do with this little comic book before you. Back in the olden days, when animation was cheaper and they didn’t have several cable networks devoted to cartoons, there was a series called Superfriends. Produced by Hanna-Barbera, the series starred DC Comics most popular heroes and ran from 1973-1986 in a variety of formats. It started out trying to be educational, with the Justice League routinely facing misguided but well-meaning mad scientists who did things like shrinking everyone on the planet as a way of dealing with overpopulation. Then they had the superheroes fighting actual supervillains and things got better. Somewhere in the middle of Superfriend‘s run, Hanna-Barbera decided to introduce their own original characters into the show. Why? Because most of Hanna-Barbera’s cartoons at the time featured teen protagonists and a wacky animal sidekick and Donny and Marie Osmond were really popular at the time. Thus were Zan and Jayna – two alien teens from the planet Exxor – inducted into the Superfriends, along with their blue space monkey Gleek. Because everything is better with monkeys! Strangely enough, the Wonder Twins didn’t have much staying power and were eventually phased out of the show in favor of Firestorm and Cyborg – two teenage heroes with major followings in the actual comics. Still, they made enough of an impression that several writers tried to introduce them into the DC Comics universe at large. First seriously. Then ironically. This new Wonder Twins series is heavy on the irony, but there’s a surprising amount of heart behind it as well. The plot is that Zan and Jayna found themselves exiled from their homeworld for unspecified reasons. Superman, who owed their father a favor, made arrangements for the twins to start school at Metropolis High and got them a job interning at the Hall of Justice. Jan is a quiet introvert, who is worried about making a good impression. Zan is a brash extrovert, who is worried about making a good impression… on the girls of Earth. Mark Russell writes this series more like a work of young-adult fiction than your typical superhero comic book. This makes Wonder Twins the first of DC Comics’ new Wonder Comics line that reads like it was actually written with teen audiences in mind. There’s a few nods to the old Superfriends cartoons, but this series is truly about the troubles a teenager faces when the usual feelings of alienation and not fitting in are exacerbated by moving to a new school. There’s also a fair bit of comedy, as Zan shares too much regarding the mating habits of the Exxorian people, which make the Vulcan pon farr look like the town from Footloose. All of this is beautifully illustrated by Stephen Byrne, who utilizes the same sense of smooth style he brought to the Rebirth Green Arrow title. The character designs are simple and streamlined yet visually distinctive. Byrne’s use of color is also fantastic. The only real flaw to the issue is a few jokes that seem out of character for the characters saying them, which pushes the fourth wall a little too far. I can cope with Superman being sarcastic about the rather ludicrous steps required to get rid of Mr. Mxyzptlk. I can’t believe that Wonder Woman would ever be so rude as to describe another superhero’s powers as “underwhelming”. Still, this is a fun comic with great artwork that most teenagers will get a kick out of. Adults who are young at heart may get something out of it as well. 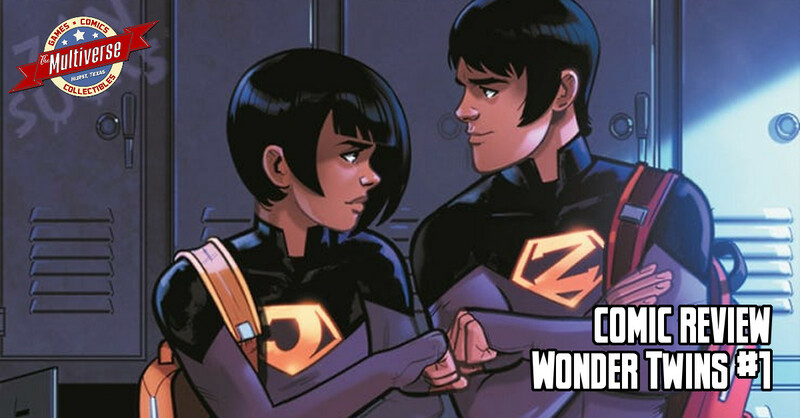 Wonder Twins #1 releases on February 13, 2019!